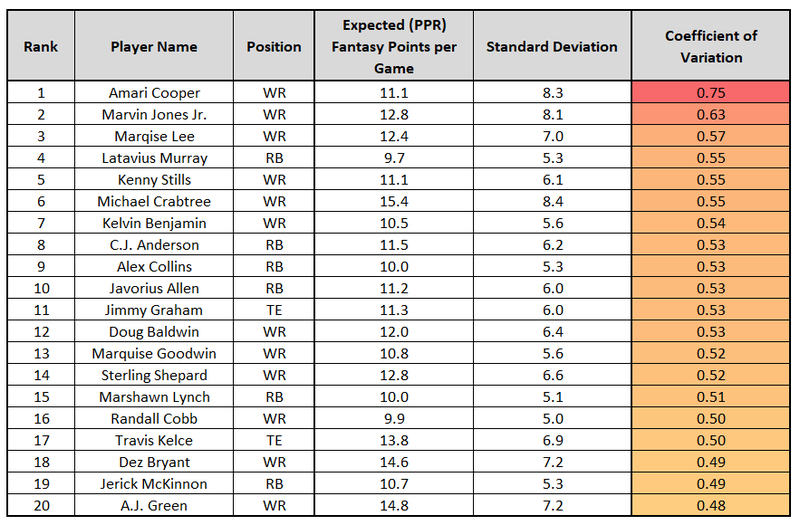 In our most recent article, I took a look at the 20 most and least consistent players for fantasy. We determined this by first looking at each player’s scoring output on a week-to-week-basis and then by calculating each player’s coefficient of variation. Today article, I wanted to take the same approach, but focusing instead on the consistency of a player’s role (rather than their production). I suspect this might be even more valuable for fantasy purposes, because it removes efficiency (less stable than volume on a week-to-week-basis) and touchdown luck from the equation. Before we dig deep into the analysis, it’s important to note the overlap between this chart and the chart in our last article (highlighting the most consistent scorers for fantasy). 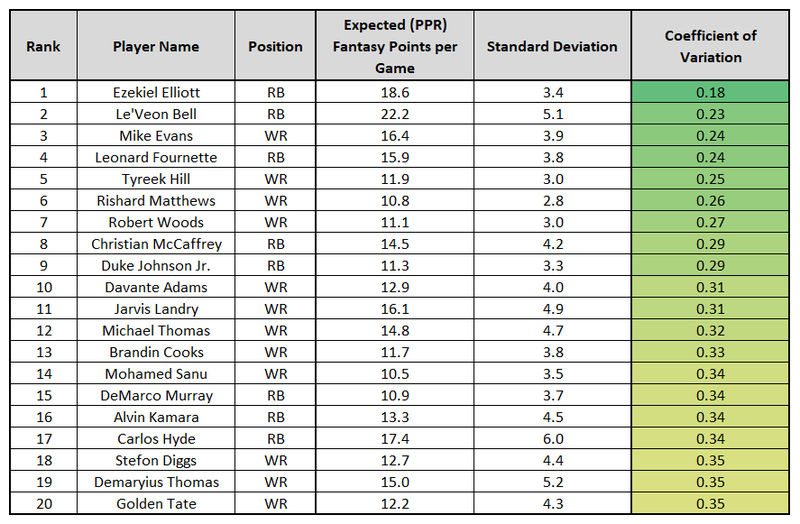 Alvin Kamara, Carlos Hyde, Christian McCaffrey, Jarvis Landry, Leonard Fournette, Le’Veon Bell, Michael Thomas, and Mike Evans all also ranked top-20 in consistency of production. For the second straight season, Elliott led all running backs in consistency of role. Elliott averaged 18.6 expected fantasy points per game last season and eight of his nine games (within this sample) fell within four points of that average. This is fairly surprising considering he wasn’t used as extensively as a receiver as some of the other running backs on this chart, but I think this points to how much the offense leans on Elliott when he’s active. I’m expecting a massive workload from Elliott in 2018, following the departures of Jason Witten and Dez Bryant (who make up 41 percent of Dak Prescott’s career pass attempts), though receiving volume will be the key to Elliott putting up Le’Veon Bell-type fantasy numbers this year. Like Elliott, Bell makes the top-20 list for the second straight season. Despite missing five games over the past two seasons, Bell still leads all running backs in snaps (by 188), carries (by 18), and targets (by 34). Since he’s always on the field and is heavily used as both a runner and a receiver, game script doesn’t matter as much for him as it does other running backs. Bell also led all players in expected fantasy points per game last season (22.1). Bell is well worth the first overall pick, as we outlined here, offering the best and nearly the most consistent usage of all players. Evans’ volume was much more consistent in 2017 than 2016, totaling at least 10.0 expected fantasy points in every game he played. Using simpler metrics, he averaged between six and 12 targets in every game he played. Hill ranking so highly was quite the surprise, given the volatility of his production, but his volume was more consistent. He had between five and eight targets in 13 of 15 games, and in the three games he saw fewer than six targets, he made up for the lower target total by totaling a combined four deep targets and four carries in those games. Although Woods was highlighted as being one of our least consistent players in terms of production, this was due to high efficiency numbers, while his volume was actually quite stable week-to-week. 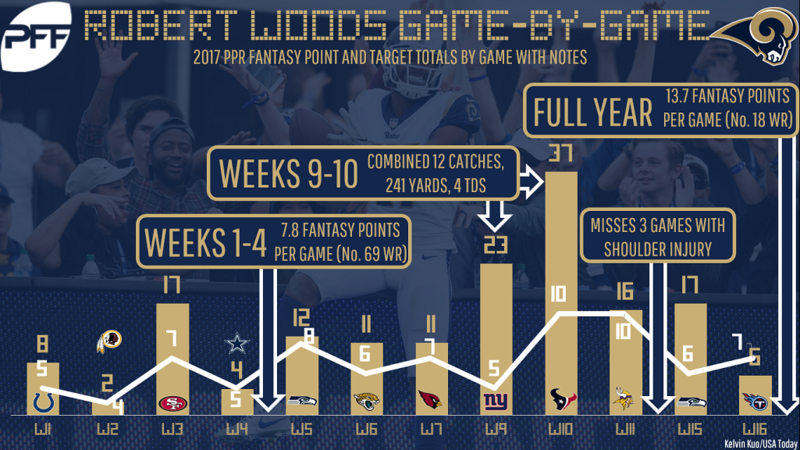 Woods saw between five and 10 targets in every game he played, and in the three games he saw fewer than six targets, he made up for it with an end-zone target in each of these games. McCaffrey and Johnson were surprises, given that scatbacks are typically far more inconsistent in usage than workhorse running backs (due to their dependence on negative game script). However, that wasn’t the case here. Both fit the stereotype of “high-floor/low-ceiling” players, so their ranking does make sense. There were relatively few “boom” games from both (based on volume) and in their low-target total games their difference was mostly made up for by an increase in rushing attempts or near-end-zone work. Like with our last chart, there was a good deal of overlap between this chart and our chart representing the top-20 most inconsistent players by production. All of Alex Collins, Amari Cooper, C.J. Anderson, Jerick McKinnon, Jimmy Graham, Kenny Stills, Marqise Lee, Michael Crabtree, and Sterling Shepard made both charts. In an effort to save time, I’ll try to avoid writing about players we already discussed in our last piece. We already spent a good deal of time on Cooper in our last article, but it’s interesting to note he was our least efficient player in both usage and production. Perhaps new head coach and offensive play-caller Jon Gruden gets him more involved and on a more-consistent-basis next year, as he’s promised to do. While Golden Tate was one of our 20 most consistent players, Jones ranked second-least. He saw fewer than five targets in five games and more than eight targets in four games last year. He had three games with at least 20.0 expected fantasy points and seven under 10.0. Baldwin was our fifth-least-consistent player (by role) in 2016 and now again ranks top-12 in inconsistency. Over the past two seasons, Baldwin has played in eight (of 32 games) where he saw at least 10 targets (as high as 19 in one game) and nine games where he saw fewer than six targets. I have high hopes for Baldwin this season, after the departures of Jimmy Graham and Paul Richardson to open up more targets available to him, and after the arrivals of Richard Sherman, Marcus Peters, and Aqib Talib onto the rosters of their NFC West opponents (all are cornerbacks who won’t see much of Baldwin in the slot). Still, due to this fairly robust sample of inconsistency, Baldwin isn’t someone I’m ever willing to play in DFS cash games, though he’s a much better play in DFS tournaments and in best-ball leagues (where variance is less of a concern).